President Salva Kiir of South Sudan at the signing ceremony in the country's capital, Juba. In a statement issued late yesterday by his spokesperson in New York, Mr. Ban commended the Intergovernmental Authority on Development Partners Forum (IGAD)-led mediation for its tireless efforts to bring the peace talks to a successful conclusion. “He is heartened by the unity of purpose that regional leaders have displayed in seeking an end to this tragic conflict. Their continued positive engagement remains essential to the achievement of lasting peace in South Sudan,” the statement added. “Now is the time to ensure that this agreement translates into an end to the violence, hardship and horrific human rights violations witnessed throughout this conflict,” the Secretary-General said in his statement and added that the UN stands ready to support the Parties in the implementation of this Agreement, in close cooperation with IGAD, the African Union and international partners. Mr. Ban urged the parties to work in good faith to implement its provisions, beginning with a permanent ceasefire and the granting of unhindered freedom of movement to UN Mission in South Sudan (UNMISS) and to humanitarian actors working to reach people in need of urgent assistance. Recognises that the road ahead will be difficult, the UN chief in his statement looked forward to the participation of South Sudan’s regional and international partners in the High-Level meeting he intends to convene in the margins of the upcoming substantive session of the UN General Assembly to ensure sustained support for the restoration of peace and security for the afflicted people of South Sudan. 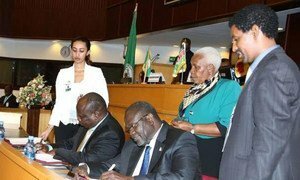 In a statement last Tuesday, Mr. Ban welcomed the signing of this agreement by former South Sudanese Vice-President Riek Machar and former detainees. At that time, according to media reports, Mr. Kiir, who initialled but not yet signed the agreement, had asked for additional time to consult with his constituencies. The security situation in South Sudan has deteriorated steadily over the past year since political in-fighting between President Kiir and Mr. Machar, and their respective factions erupted in December 2013. The hostilities subsequently turned into a full-fledged conflict, resulting in reported atrocities and possible war crimes. According to the latest estimates released by the UN refugee agency, more than 730,000 people have fled into neighbouring countries such as Uganda, Ethiopia, Kenya and Sudan, which has seen the highest arrival rate this year. Meanwhile, another 1.5 million remain internally displaced, often relocated to increasingly overcrowded ‘protection-of-civilians’ sites run by UNMISS. United Nations Secretary-General Ban Ki-moon today welcomed the signing by former South Sudan Vice President Riek Machar and the Former Detainees of the compromise peace agreement put forth by the Intergovernmental Authority on Development Partners Forum (IGAD) mediation, meant to end the conflict raging in the country for the past 20 months.